The Key is Joan’s amphetamine album. That’s not to suggest that she was taking drugs (far from it, most likely); instead, it was the music that felt rushed and jumbled. Produced by Val Garay, the album again featured a stellar cast of modern rock musicians including Adrian Belew (his elephantine footprints are all over the flip side, “Business Is Business”), but there was something missing this time: inspiration, direction? 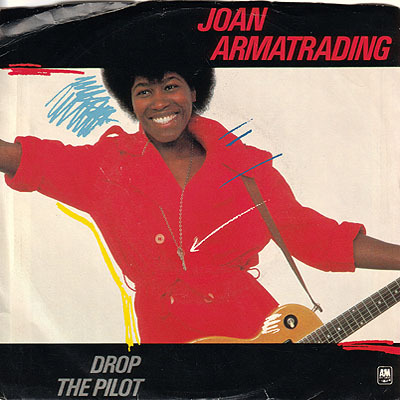 Audiences didn’t seem to notice the difference, and “Drop The Pilot” became one of her biggest hits. I noticed the difference. I fell head over heels in love with Walk Under Ladders, yet resisted the aggressive overtures of The Key. Was it just me, or did “Drop The Pilot” sound off-key? It was a square peg being stuffed into a round hole, a point made more obvious if you caught Joan’s performance on Top of the Pops. “Me Myself I” and “When I Get It Right” were beacons when I first heard them because they sounded like little else on the radio. “Drop The Pilot,” by contrast, fit in with the overproduced 80s, a period that for me represents one of the lowest creative points in music’s history. “Business Is Business,” produced by the otherwise inerrant Steve Lillywhite, is another mess that suggests those strange-for-strange’s-sake 10cc songs. It didn’t make The Key’s cut for a reason, fair warning that you can live without it. Track A1 produced by Val Garay, A2 produced by Steve Lillywhite. Photography by Jamie Morgan. Painting by Donna Muir. Released on 7-inch and 12-inch single in February 1983 in the UK (A&M, AMS/AMSX 8306), in April 1983 in the US (A&M, AM-2538), and in 1983 in Australia (A&M, K9019) and the Netherlands (A&M, AMS 9259) with picture sleeve; reached #11 on the UK charts and #78 on the US charts (charted on May 28, 1983 for 6 weeks).